Did you really clean that board well enough? I have seen acid damage before, but nothing as sneaky and widely-spread as this. Components all across the main processing board were showing signs of corrosion and damage, but I could also see that repairs had been done, several components and ICs had been replaced and sockets added. Someone cleaned up battery damage and added an external battery pack. But there was still major corrosion on the board… what gives?? 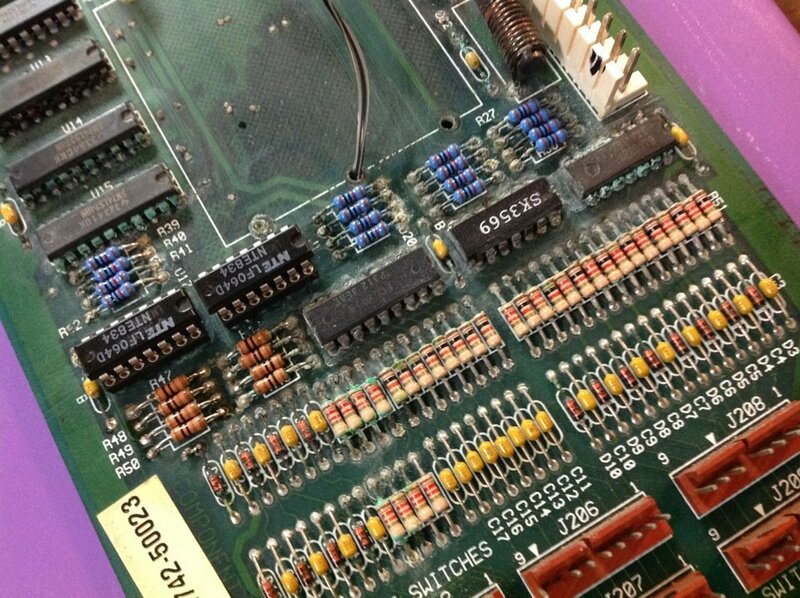 My theory is that whoever cleaned the circuit board, instead of using vinegar and multiple paper towels or q-tips, they probably used a single wipe, and in the process of cleaning the circuit board, actually spread the acid all over the components! At the time, they thought it was clean, but they actually made the problem worse. This is why it’s very important to thoroughly clean off any leaked electrolyte from batteries, and use vinegar to neutralize it, and use multiple wipes — do not wipe from one area to another area. Work on small parts of the board at a time, throw the q-tip or paper towel away and use a clean one when you start to work on another area of the board. Do not risk spreading the acid to previously un-damaged components. This entry was posted in Circuit Board, Maintenance, Solid State, Uncategorized, WPC-89, WPC-95 and tagged acid, mpu, sttng by admin. Bookmark the permalink.